JAMMU, APRIL 03: In the series of his visits to the districts going to poll in the first phase of Lok Sabha elections, Director General of Police Shri Dilbag Singh today visited Sopore and Bandipora to review police arrangements for the upcoming elections. He took stock of the deployment of police and CPMFs in the areas of these districts. 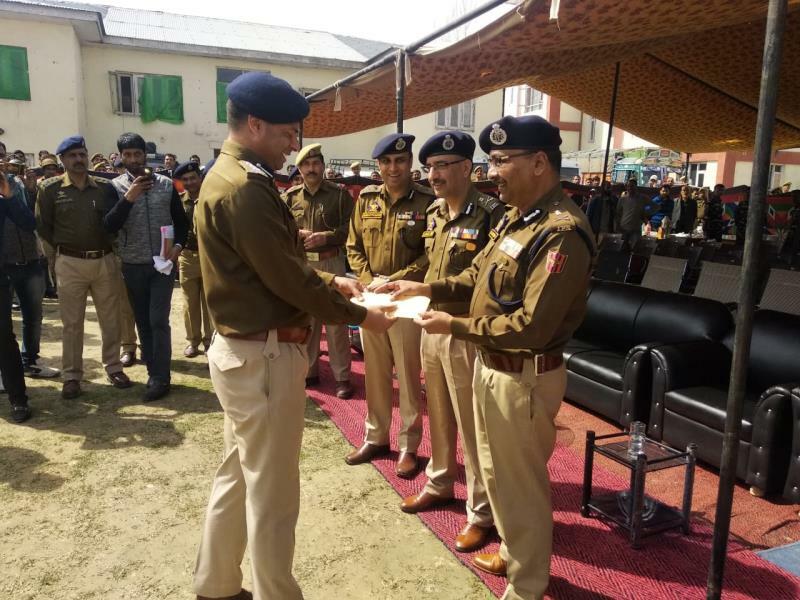 Addressing the officers and Jawans at District Police Lines Sopore and Bandipora, Shri Dilbag Singh said that conduct of peaceful elections in the state is yet another challenging task for J&K Police and the force is fully prepared to maintain law & order during the elections as it has done recently by holding peaceful Urban Local Bodies and Panchayat elections in the state. He said that various components under the command of officers have been formed for maintaining law & order during the elections. The DGP interacted with the members of these components and emphasised upon the personnel to exhibit high standards of discipline in the field and work with dedication under the control of their respective commanders. He advised that coordination among the components and implementation of orders from team leaders is mandatory for the personnel in the field to get desired results. J&K Police has been working for the protection of people and every care should be taken for the security of the public, the DGP added during his interaction with the officers and the personnel. Stressing for adherence to laid down procedures and briefings by the commanding officers with their Jawans will boost the morale of subordinates and will also enhance their working capabilities in the field. Shri Dilbag Singh complimented the officers and Jawans for their performance in accomplishing multiple tasks and challenges. He said that J&K police has faced various challenges and is always ready to complete any task as per the expectations. During his visit, DGP was accompanied by ADGP Armed J&K SJM Gillani, IGP Kashmir Zone Shri S.P Pani and DIG NKR Baramulla Shri M Suleman Choudhary. The senior officers also interacted with the police personnel. SSP Bandipora Shri Rahul Malik and SSP Sopore Shri Javaid Mir briefed the DGP and other officers. Cos of IRP/Armed battalions and other police officers were present on the occasions.